According to the local media reports, hundreds of homes in Townsville were already inundated. 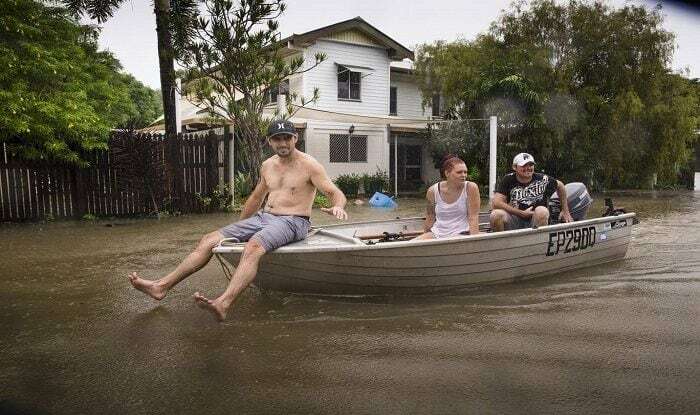 Canberra: Thousands of people from Australia fled from their homes following a devastating flood that hit the northeast regions including Queensland. The floods brought snakes and crocodiles onto the streets and disrupted electricity supply in the region. Due to the intense rain on Sunday, authorities were forced to open the floodgates on the Ross River Dam. They released around 1,900 cubic metre of water per second downriver to ease the pressure. However, this caused flooding which worsened on Saturday. Therefore police in parts of Queensland were going door-to-door to warn residents to leave their homes. Hundreds of homes in Townsville were already inundated, stated local media reports.Meanwhile, a three-meter crocodile was spotted by the emergency services on a road in the city on Sunday night. Some of the residents also posted pictures of the reptiles on their social media accounts.